If ya really can't accept a little pit on the cam. Send it my way, I'll put it out to pasture. My 550 could use that if you've still got it. ...if it is a lobe, it may eventually cause rocker foot wear on that one rocker, but nothing serious. I have seen high-mileage engines with cams like that, and the only place that wore was right around those pits: it lost a little cam lift. 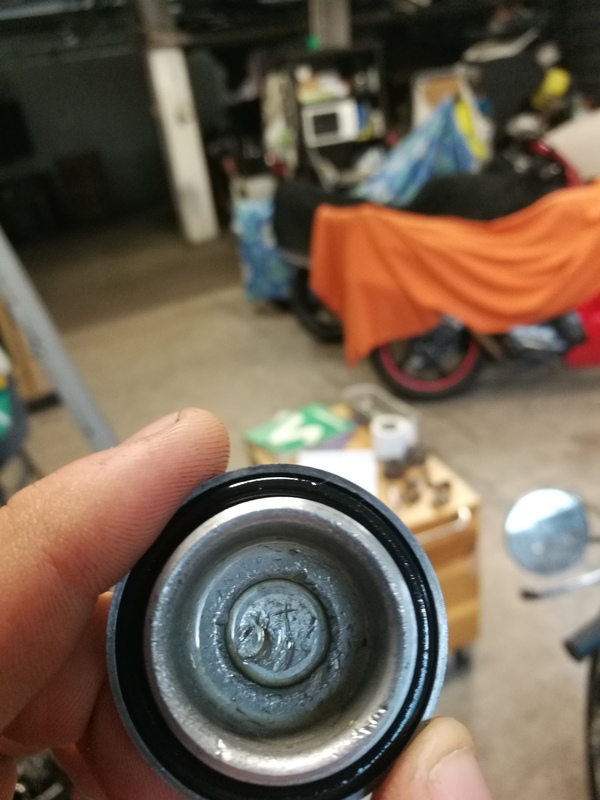 ...if it is on the bearing, I wouldn't flinch to re-use it, but not with light oils. A local shop advised a grind on all the lobes. The base circle is already at 1.00, would this be a good idea? No, i have worked on these for many years and that will run ok for a long time. Yoshi cams need a lot more ignition advance depending on grind and also you need a bigger rear sprocket as the power band is pushed higher up the rev range. I wouldn't say Yoshi cams per say bryanj,and as far as a larger rear sprocket all your doing is gearing it all down,torque is what ya want. so in essence you lost low rpm torque? I think Honda got the gearing spot on for the 500/550s?they just lacked a little torque in my opinion?having the little engine try to make more power with more torque just wasn't gonna happen with just an over bore on the 550?but gains can be had with cleaning up head ports and use of electronic ignition. Does anyone have figures on a cam profile that would really up the midrange punch? I've got two cores and live an hour away from delta cams. the extra punch you want comes from more cubes,honda did well on these high revving motors to allow a good torque range from 2500 to 10,500 in top gear without a down shift,any cam hotter will lose a little low rev torque to gain less up top,the whole engine configuiration was designed to provide a wide torque band never seen before on bikes,the pommy twins had no hope of keeping up,these were built so anyone could ride them without being so savvy in feeling the engines torque and rpm limits etc and how to ride,they introduced new riders to bikes that otherwise may not have bought them,great design and marketing so long ago,the universal Japanese bike!you can also go the other way with camshafts,cause heaps more torque but lose horsepower all over,just use some of that go fund me money? It's not perfect, but smoothed with a fine oilstone it will run for years without problems in my opinion. Low spots won't cut the "bearing" (they run in the head alloy, there is no bearing insert) - I believe that is a bearing journal, not a lobe... even on a lobe, the tappet face is wide and hard and I wouldn't expect any problems. Not sure about the "121" grind, but it should produce some power increase at higher RPM and still idle well if it is OK for stock springs. Yoshimura didn't weld up stock cams or use new blanks as I recall, so any lift increase means the base circle is ground down that much. Check clearance to the adjuster caps as that makes the tappet end sit higher, I've seen caps with rocker impact damage. yeah rocker to cap damage is common if the rocker cover has those worn out non locked earlier rocker shafts. if not worse,i owe too tired for stealing this shot,the very worn housing lets the shaft move up,at worst it gets to the point you have trouble adjusting the valve properly and don't know why? Does this happen with the later models aswell? I think the mod was 77 but check the bulletins. do what i did (click my signature link), i think that's the max you can get out of the 550 for midrange punch, unless you drop in a complete 650 engine. all hotter cams will sacrifice midrange to increase top if you don't do anything else, like increase compression and add more charge via porting etc.